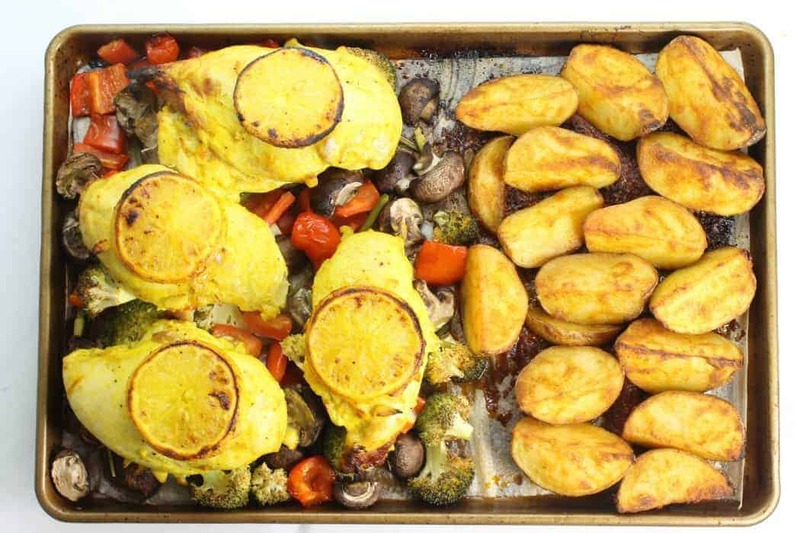 Looking for a quick and easy meal (that’s healthy to boot!) but tired of the same old go-to recipes you usually cook? Tacos! 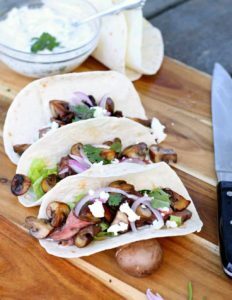 Specifically these mushroom and flank steak tacos. Stuffed with cilantro sour cream, red onion, goat cheese, and lime, they are easy and delish! A dish with Mexican roots, tacos have quickly become a main stay of college students, and family dinners in North America. Tacos are usually made from either hard corn shells or soft flour tortillas then filled with various toppings. Here in Canada we all to quickly associate taco’s with ground beef seasoned with various spices, then stuffed in the above mentioned corn shells or tortillas before topping with lettuce, tomatoes or salsa, sour cream, and grated cheese. Limiting taco’s or taco night to this flavor combination hardly serves this unique food item justice and quickly gets boring. 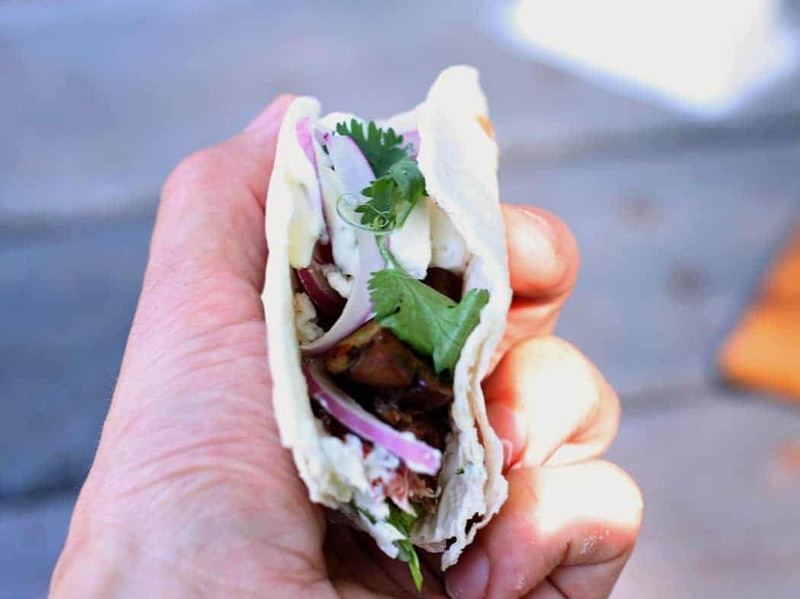 So when you’re in need of a gourmet snack, crowd pleasing appetizer, or quick and healthy meal why not break the mold and do tacos…but tacos done differently!? The key to any taco is keeping it to 3 or 4 ingredients, for maximum ease! This makes assembly quick and easy, limiting how much you have to actually cook. In this steak taco recipe, the only real cooking involves mixing up the flank steak taco marinade, and grilling the steak. Marinate the flank steak in this marinade mix for 24 hours in the fridge. Simply toss everything in a bag with the flank steak and let it sit for a day. With a little bit of planning, putting these gourmet tacos together couldn’t be easier. Marinate your steak the day before you plan on making these. Get all your toppings together, and have them ready to go in bowls to make assembling the tacos quick. 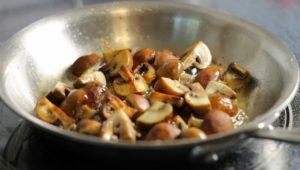 Sautée the mushrooms in oil or clarified butter. Let them get nice and brown for maximum flavor! Season with a little salt and pepper and set aside with your other garnishes. Grill the flank steak on a BBQ or over a charcoal fire, I recommend cooking it medium rare, but you can cook it to whatever done-ness you like. Let the steak rest for 5 minutes to avoid all the juices leaking out when you slice it. Slice the steak, and mix in the cooked mushrooms. toss some chopped cilantro in and season with fresh ground pepper. Top the taco shells, with the cilantro sour-cream, shredded lettuce, mushroom & steak mixture, julienne red onion, and goat cheese! 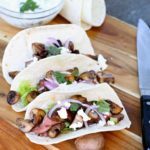 Serve these delicious little mushroom and steak tacos as an appetizer at your next BBQ summer party of dinner party to blow away your friends! They are guaranteed to love them! Steak and mushrooms are the definition of comfort food! 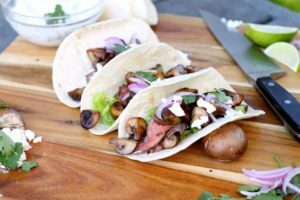 These steak tacos are the perfect appetizer or gourmet snack for mushroom lovers! For best results and a quick execution, marinate the steak the day before! One individual taco has a calorie count of 252.9 calories. These look perfect! I have been needing to change up the taco game in this house. Definitely putting into the rotation. These sound delicious!! Love the steak and mushroom combo. I also always find tacos difficult to photograph for some reason, but I think you nailed it here! Thank you! I did have a bit of an issue with them, i have his vision in my mind of what I wanted it to look like, but it didn’t turn out that way. Still tastes delicious though! That happens to me all the time! Rarely do my real photos match up to my vision. Practice does help, though, which is no comfort to my poor family, who is always waiting to eat while I hurriedly try to take a few pics. Ha! These look amazing! I’ve done steak tacos before, and I’ve also done mushroom tacos before… but oddly enough, I never thought to pair the two together in a single taco like this. Love the addition of goat cheese, too! The goat cheese is just like the icing on the cake!! Rich and creamy to an already rich and flavorful meal!